This squirrel knows how to get down. 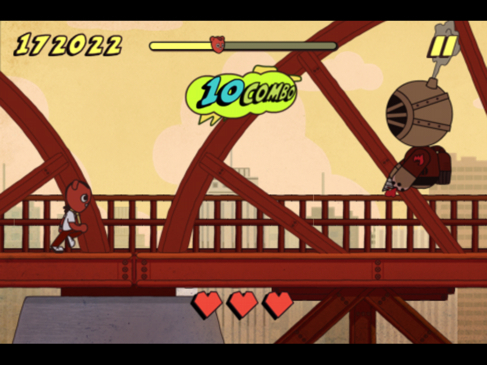 Mad Acorn is a rhythm-based running beat-em-up, also known as the first of its kind. There's a little Streets of Rage in there, along with some Canabalt and Guitar Hero/Rock Band for good measure. That sentence alone should immediately send you to the App Store, where the game is currently on sale for $0.99; it's normally $2.99. If you crave more info, well, that's what this review is for. It breaks down like this: each 2D stage puts you in control of "Mad Acorn" the Rhythm Squirrel, a critter that also moonlights as a detective. Similar to all running games, Acorn can't stop moving from left to right across the screen, and it's your job to help the little guy jump over spikes and punch bad guys, but here's the thing, each tap is a musical note that enhances the already catchy background music. The idea is to get into the groove, jumping and pummeling bad guys to the beat. You'll even witness segments where Acorn performs a long jump with his white shirt fluttering in the wind. Not sure if the developers at APD Inc. channeled Michael Jackson's "Black or White" music video. Regardless, that's what it reminds us of. On that note, we love this game. The character's likeable, the original music (from underground artists) perfectly fits and beating up bad guys, watch out for the behemoth that bears a striking resemblance to BioShock's Big Daddy, never gets old. In fact, we couldn't help ourselves from plowing through all of Mad Acorn, just to see what the next level would bring. In addition, the game features a satisfying level of replay value, largely because of Game Center leaderboards and in-game achievements. You'll want to get all of the stars in every board, and curse whenever you accidentally lose the beat and take damage, or die before reaching the end. Where this title falters, the only problem, is with the visuals, which look noticeably low-res on the iPad. You won't find retina support for Apple's latest tablet and that's a shame, since the graphics would shine if only APD upgraded the artwork. We'll cross our fingers this'll happen in a future update; we already know more levels are on the way. With this in mind, we can't recommend Mad Acorn enough. There's simply nothing quite like it on the App Store, and it's more than a bizarre curiosity. This is a well made and immensely entertaining video game that'll have you tapping a foot and nodding your head in no time. 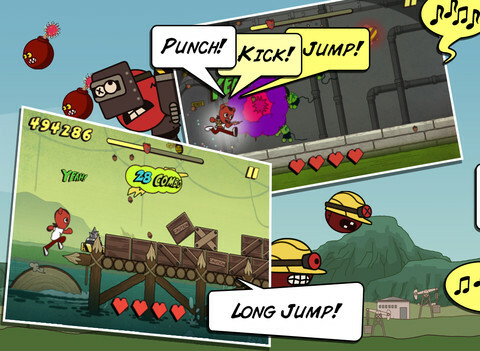 What's Hot: Sixteen original tracks, four environments, addictive tap-tap gameplay, comic book style presentation, cool variety of enemies, leaderboards. What's Not: Graphics don't look so hot on the iPad.